Former President Barack Obama shared a sweet message for his wife Michelle Obama on her 55th birthday and it soon became viral with over four million people liking the post on Instagram and Twitter. “I knew it way back then and I’m absolutely convinced of it today – you’re one of a kind, @MichelleObama, Happy Birthday!” Obama wrote in the post, along with sharing a throwback picture of the young couple. Screenshot of Barack Obama’s post for Michelle Obama on Instagram. 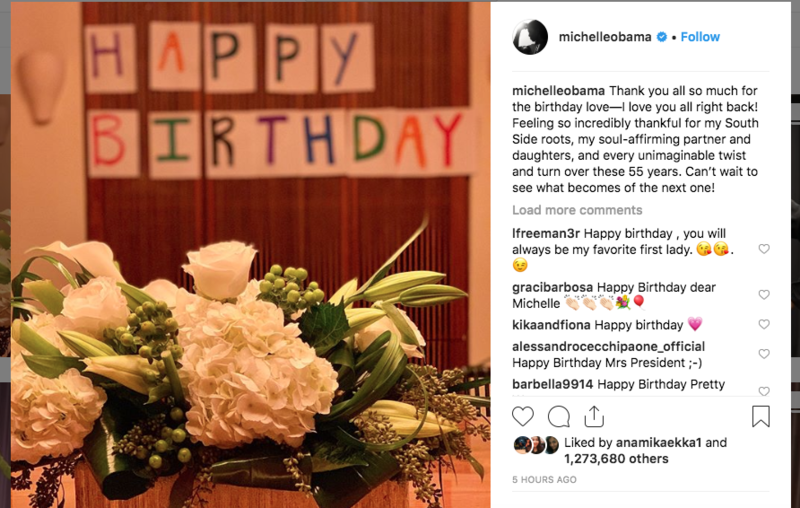 The former first lady responded to all the wishes on Instagram by sharing a picture of flowers, with the caption: “Thank you all so much for the birthday love — I love you all right back! Feeling so incredibly thankful for my South Side roots, my soul-affirming partner and daughters, and every unimaginable twist and turn over these 55 years. Can’t wait to see what becomes of the next one!” Michelle wrote. Aside from her husband, there were multiple A-listers and old friends who wished her a happy birthday, including Beyonce, who posted a childhood picture of Michelle with the words “BOW DOWN” written in all caps. Former FLOTUS’ ‘Becoming’ topped the bestseller’s list last year and according to latest data from Amazon Charts, the book now has the longest top best-seller streak across all formats, selling over 3 million copies. Next articleFarooq Abdullah addresses the gathering at United India Rally, calls EVM, a chor machine.